Sorry Knicks Fans, LeBron Goes Hollywood!! Everyone seems to think that LeBron is going to the Knicks. Even the Cleveland fans think that. And after the Celtics defeated the Cavaliers 94-85 to end LeBron’s season and perhaps his career in Cleveland, everyone in world seems to think the same thing. LeBron-to-the-Knicks talk seems to hinge on another superstar free agent coming along with him. Either Dwayne Wade or Chris Bosh. Or Both. There are too many moving parts that need to come together for this to happen. Why would he leave a pretty good Cleveland team and go to a total rebuilding project? That doesn’t make sense. The move that makes more sense and is infinitely more entertaining is LeBron to Los Angeles. No, not the Lakers. . .the CLIPPERS!! 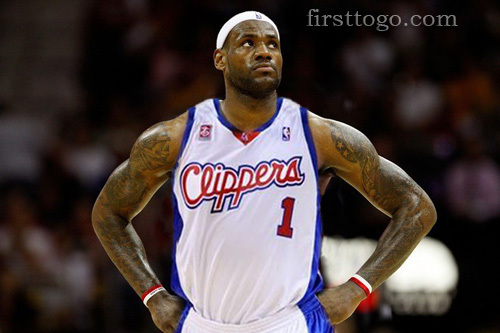 The Clippers have all the cap room they need to sign LeBron. They have an opening at the head coach position to bring in any one of LeBron’s choosing. They can even make a run at Phil Jackson if that’s what LeBron wants. And they already have a better team than the Knicks. Think about this starting lineup; Baron Davis, Eric Gordon, Blake Griffin, Chris Kaman and LeBron James. Go ahead, ponder that for a bit. Davis would actually be interested in playing basketball again. Griffin would have less pressure on him and probably stay healthy for the whole season, Kaman would continue to be an All-Star and Eric Gordon could continue to be Eric Gordon. You have to admit, on paper, that’s a pretty good team. It may not be a championship caliber team but neither are the Knicks. And L.A. has better weather than New York. Think about all the things LeBron could do in Hollywood; cameos on “Two and a Half Men,” stopping by the “Tonight Show” just to say hi or even remaking “Kazaam.” Hollywood makes more sense for LeBron, Inc. than Manhattan. Clipper games would then become a place for Hollywood stars to be seen. And if they played it right the Clippers could get all of Young Hollywood to attend. Forget about Jack and Denzel. The Clips would get Leo and Toby, Paris and Lindsey, even that guy from the vampire movies. LeBron would be THE star in a town full of stars. And now for the real drama. Think about LeBron AND Kobe in the same city. Hell, they would be in the same arena! They would play each other four times a year instead of two. Can you see LeBron pushing Kobe to be better, Kobe daring LeBron to take his Number 1 spot? It’s a season long soap opera. 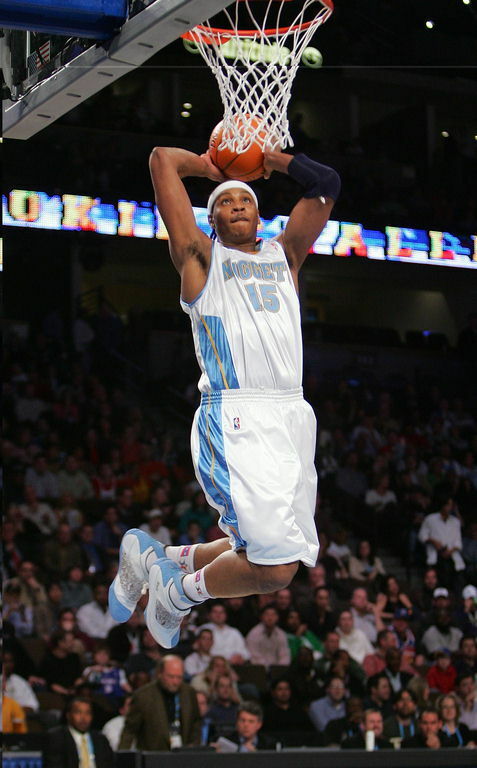 David Stern must make sure this happens. Of course all this depends on Clippers owner Donald Sterling to stop being Donald Sterling. Yes, Sterling the worst owner in all of professional sports. Sure, he would rather trade a star player rather than pay him what he’s worth. We all know he’s a cheapskate. However, I think he’s tired of playing second fiddle to Dr. Jerry Buss and the Lakers. This could be the one chance for him to be the Big Man on Campus. This is his one chance to garner all the headlines. This is the one time that he will release the vise grip on his checkbook and pay LeBron whatever he wants. Sure, all this is a long shot, but L.A. is a city full of long shots. Hundreds of kids show up every day with hopes of becoming a superstar. Besides, you know what they say about Los Angeles: If you can make it here, you can make it anywhere. Was That LeBron’s Last Home Game as a Cavalier?? 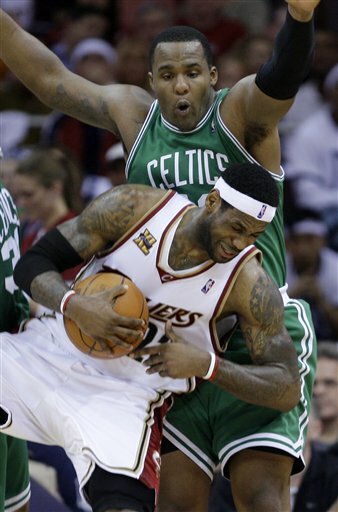 I was not planning on writing about Game 5 of the Cleveland Cavaliers-Boston Celtics series. But since the Western Conference Finals do not start for approximately 23 days, I was forced to write about something. So Game 5 was it. LeBron James and the Cavs gift wrapped this column for me. Thank you. The Celtics handed the Cavs their worst playoff defeat in team history. It was a 120-88 beat down that was not as close as the score would make it seem. And LeBron reverted back to his “LeBrick” alter ego. He looked so uninterested during this game it was scary. The way he was just standing around watching the game was so odd. I’m not sure if it was the elbow that was bothering him or he had a cold or maybe he was drunk. I don’t know, but they better come up with a reason today. Because it looked like he just gave up. The post game press conference didn’t help either. LeBron seemed less interested in that thane he did the game. He said how he has “spoiled” the fans with his play and has had only “three bad games in seven years.” I’m telling you, this guy just doesn’t get it. First of all, three bad games in seven years is a ridiculous statement. He’s had three bad games in this series! So let’s get rid of that. Second, it’s one thing to have a bad game; everyone does. But it’s entirely different to have a horrible game at home, in the playoffs, after you just won the MVP, and your team has the best record in the NBA. To be fair, the series is not over. The Cavs still have to lose another game. And a lot of credit has to be given to the Boston Celtics. They have turned out to be a better team than a lot of people thought they would be. Myself included. So now they head back to Boston for Game 6 and the Cavs are in a must win situation. LeBron has another chance to step up and be the superstar that everyone wants him to be. And he’s going to have to have a great game to beat the Celtics at home. But I just don’t see it happening. The Celtics know how to close teams out. Here’s an interesting fact: The Cavaliers have never won a series when they have been down 3-2. The best part of this game is all the speculation that this may have been LeBron’s last home game as a Cavalier. So of course I’m going to jump right on that bandwagon. Every New York Knick fan must be celebrating like they just won the championship. But I can’t see LeBron going there. He’s got a better team in Cleveland right now. If he goes to New York you know he is not serious about winning a title. If he goes to New York it’s going to be all about LeBron, Inc., scoring titles, MVP awards and Jay Z videos. And that’s another thing; It doesn’t seem like LeBron has that killer instinct that Michael Jordan had or that Kobe Bryant has. And I’m not sure that is something he can learn to have. He should stay in Cleveland, in my opinion. If there was ever a player who was born to play in Cleveland its LeBron James. Plus, there’s no way he can go out like THAT! He needs a chance at redemption. Whether he stays or goes one thing is for certain; LeBron is going to have to do a lot to make everyone forget about his performance last night.